Puzzlemad New Additions: At the top of his game! You all know that I love the work from Brian Menold, craftsman and owner of the Wood Wonders store. In his last update he had produced a few puzzles from one of my favourite designers, Chi-Ren Chen. One of the designs was Trombone, a three piece burr in a cage with level 27.1.3. 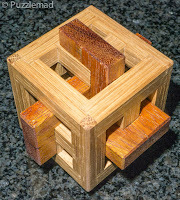 Brian likened it to Tom Jolly’s Caged Knot but I think it is also similar to Alfons Eyckman's Missing Link. Now all of Brian's work is beautiful with a lovely choice of wood and a beautiful finish to them. It is a sad fact that all puzzles that go on display in my living room have to be personally vetted by the present Mrs S for beauty before being allowed outside of the study. It says an awful lot about him that he has more puzzles in the living room than any other craftsman! 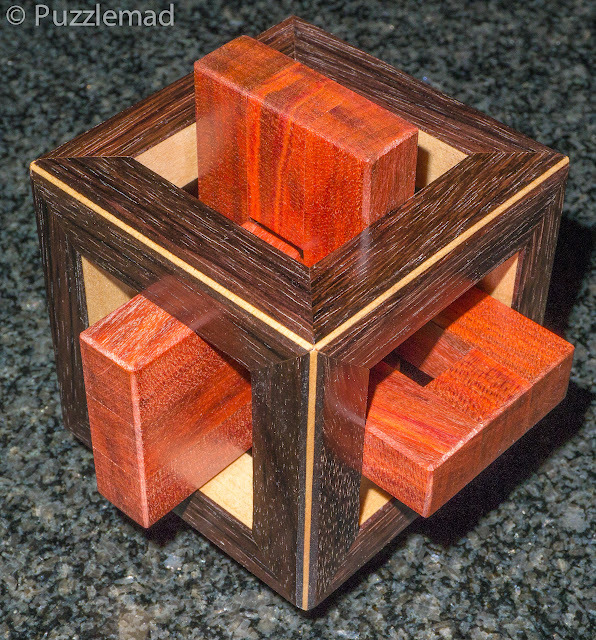 Sometimes in my spare time I will take one of the puzzles on the bench and spend a bit more time on it. Often these are just me trying out different things and the puzzle winds up in my wood stove. Other times, things come out quite nice! With each update, I hope to be able to post one of these items for sale. I will be selling them for a bit more than the normal puzzles but at a discount considering the amount of time invested. I managed to nab the very first of his special puzzles - this particular copy of Trombone has a Maple and East Indian Rosewood two-toned frame with Redheart pieces. The inside of the frame is maple and the outside is East Indian Rosewood. These pieces are signed and dated and one-of-a-kind! I am sure you all agree that it is absolutely stunning! It is so good that Mrs S has allowed it to go straight into the living room display. I haven't managed to solve it yet - there is quite a lot of movement in it and quite a lot of dead ends.